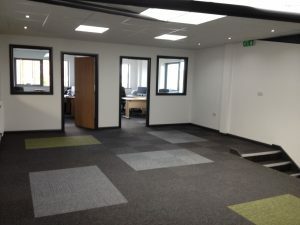 Graham and Bev Dewhurst from Geko Engineering, in Buckshaw Village, needed a suitable floor for their new offices that would help to modernise the place. After coming to us with their desired specification and what would be required, we were able to narrow down the possibilities to what would suit their needs. After much deliberation, the decision was made to go on Burmatex Tivoli carpet tiles laid in a random pattern with the colours of the company, which we think from the photos looks absolutely fantastic.